A weekly radio show all about the unique and charming town of Commerce, Georgia. Today, we go to my interview with Dolly's sister, Stella Parton. Today's show is all about my trip to the Dominican Republic. Should parking in Commerce be limited to 2 hours? Please hit the subscribe button. It's free and helps the show! That's right! Lulu from Hee Haw joins the show today! This is a "bonus episode" featuring the sponsors of the show. Be sure to check them out on Facebook and their websites! This show wouldn't be possible without them! RaShada Wood is back to talk about her brand new book that was just released! Today's show features my interview with Commerce citizen and the face of El Parian, Alicia Vargas! Thank you for subscribing to the show! Be sure to check out my sponsors and show them some love. Shop and stay local! Listen today to 3 powerful inspirational stories that will encourage and inspire you to be a better person! Thanks for subscribing! It's FREE! Show our sponsors some love on Facebook! Do you love mysteries? Do you enjoy learning about and debating conspiracy theories? Check out today's show because it's all about JFK and if there were more than one person involved in the tragic shooting. Please hit the subscribe button and tell you friends about the show! Please hit the subscribe button. It's free! Part 2 of my interview with Eric Redmon and his family. Also, Dr. Tolbert with CCSS joins me to discuss what's taking place this month in our schools. Be sure to check out all my sponsors! Shop local! Today you will hear part 1 of my interview with the Redmon family (Bobby, Angie, and Eric). Please hit the subscribe button which is absolutely free! Help us out and give us a 5 star rating and write a short review of the show. Thank you so much! ***Also, email me your "valentine wish" and I'll read it on next week's episode! Today's special guest is local attorney and CHS Alumni, Dylan Wilbanks. We had a great conversation that you are sure to enjoy! Please take the time to visit our sponsors! If you are interested in advertising with Commerce Forever, message me on Facebook or email me at the address below. Please take the time to hit the "subscribe" button. It's free and you'll never miss an episode of Commerce Forever. This week's featured guest is the incredible RaShada Wood. She is a former CES Teacher of the Year along with the CCSS Teacher of the Year. She is an author, speaker, and singer. Listen to her in depth interview and how she got to where she is today. All of this and so much more! Please hit the "subscribe" button, give us a 5 star rating, and write a short review on how much you are enjoying the show! Thank you for listening to Commerce Forever! This week we have part 2 of my interview with Dr. Tolbert of CCSS and part 2 of my exclusive chat with the Hutto Family. Join us as we discuss what it was like hanging out with Tim Tebow. Also, get the latest news from Commerce Main Street. Last week's episode did so well that we made it on the iTunes/Apple Podcasts Top 100 Charts! Thank you all! Please share this podcast with your friends and neighbors. I couldn't do it without loyal listeners! Our ads are effective and very cost affordable! Get your business/product promoted by us! Please hit the subscribe button wherever you are listening to our show. It's absolutely free and takes 1 second to do it! This way you will never miss an episode of our weekly show. Email me your thoughts, who we could interview, and what you would like to hear on the show. 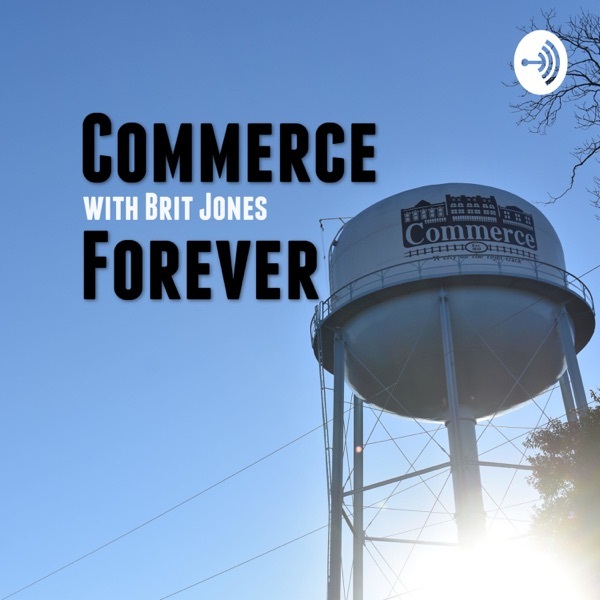 Commerce Forever is a weekly radio show that highlights everything about the city of Commerce, Georgia. Each week we will feature the latest news in the community, upcoming events, and we will interview different businesses and citizens of our small town.